Madhya Pradesh Vigyan Sabha has organized program at Vishal Mega Mart, Vijay Nagar, Indore as a part program with Bulk Consumers. In this regard we have contacted Mr. Mukesh Sharma, General Manger, Vishal Mega Mart and requested him for their permission to organize a program at their premises. 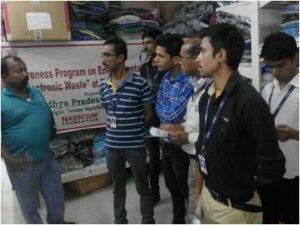 He promptly permitted us to hold E-waste awareness program on 27th May at 3.30 PM onwards. The program was attended by 16 participants. Besides these participants Dr.Fasal Hussain, Director, Unique Recycling, Mr. Rajendra Singh, CSC, Indore, Mr. Ashish Pare, MPVS, Bhopal were participated as resource persons of the program.